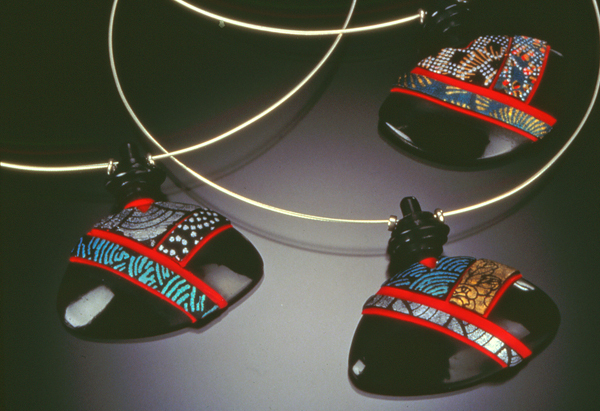 Between 1999 and 2001, Gwen fully explored screen printing on a wide variety of formats including cuff bracelets, inro, lentil beads and other jewelry forms. Gwen chose black polymer as a foil to her Japanese inspired patterns because it polishes to a luster reminiscent of lacquer. Gwen explains,“This … pendent with a lid was my solution to creating a wearable hollow form. …The patched surface is made of silk-screened patterns on translucent polymer. I consider this pendant one of my more technically accomplished (jewelry) pieces. During this period Gwen generously shared her many discoveries and techniques through workshops all across the country. 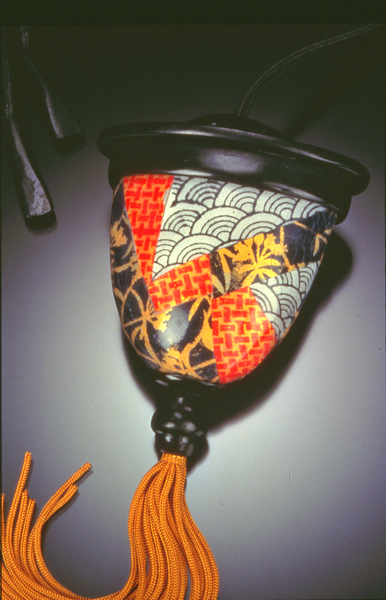 Her exuberant experimentation, her spontaneity and warmth inspired many polymer enthusiasts to adopt her techniques and forms.